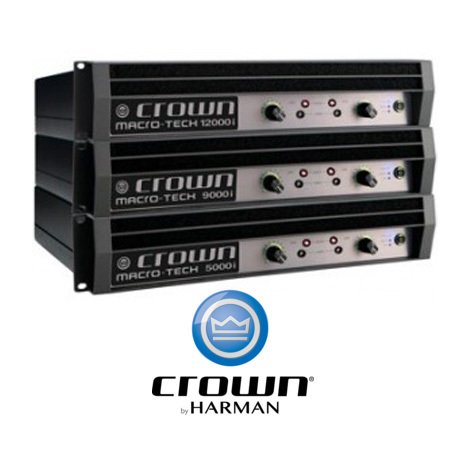 Comprised of three models – the MA-5000i, MA-9000i and MA12000i – the Macro-Tech i Series builds upon its predecessor by incorporating Crown’s advanced, patented Class-I circuitry, which efficiently delivers significantly greater power while simultaneously reducing overall amplifier weight by more than half. The new lineup is also equipped with comprehensive status, fault, and load monitoring via standard Ethernet networking and Harman Pro’s HiQnet™ and System Architect software. Furthermore, a universal power-factor corrected power supply ensures that the new models can be used literally anywhere in the world, delivering full rated power regardless of where touring schedules may lead. As is the case with all Crown amplifiers, the Macro-Tech i Series is backed by the manufacturer’s industry-exclusive Three-Year, No-Fault, Fully Transferable Warranty. he Crown Macro-Tech i Series offers amazing power, light weight and ease of use for touring sound applications. The series includes onboard analog signal processing and a built-in network connection.